A diamond-shaped reflective balloon the size of two school buses will be delivered into low-Earth orbit by a SpaceX Falcon 9 rocket in mid-November. 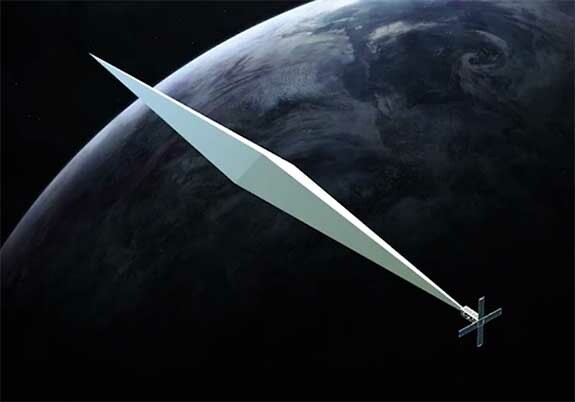 Visible from the Earth without the aid of a telescope, the “The Orbital Reflector” by artist Trevor Paglen will appear as bright as a star in the Big Dipper. The diamond will orbit the Earth for three months, after which it will fall through the Earth’s atmosphere and burn up harmlessly. The high-flying diamond could go down in history as the most widely viewed artwork of all time. Paglen collaborated with the Nevada Museum of Art on the $1.3 million project that encourages all of us to look up at the night sky with a renewed sense of wonder, to consider our place in the universe and to re-imagine how we live together on this planet. The rocket’s main mission is to place 70 communication satellites into orbit about 350 miles from the Earth. 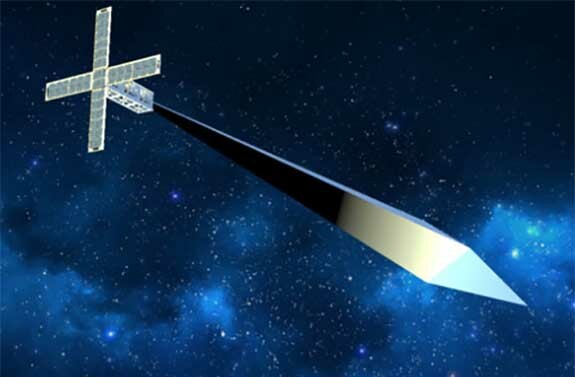 But one of those satellites will be “The Orbital Reflector.” The package will start its mission the size of a shoebox, but when it reaches the proper altitude, it will unfurl and then self-inflate into a 100-foot-long diamond in the sky. It’s actually constructed of a lightweight polyethylene material that looks like thin plastic. Reflective titanium dioxide powder coats the sculpture, making it visible from Earth with the naked eye. Skywatchers will be able to track the diamond’s path using a free app that can post alerts when the high-flying, slow-moving attraction is about to pass over a particular area. Credits: Images courtesy of Trevor Paglen/Nevada Museum of Art.